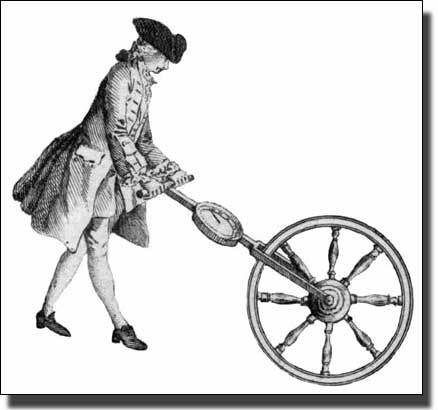 John Rocque and other surveyors used measuring equipment which had been developed over the centuries. Here he is seen at work at the top of a tower. From here he could see all the buildings and roads in the neighbourhood and he was preparing to mark out his map by using a theodolite. 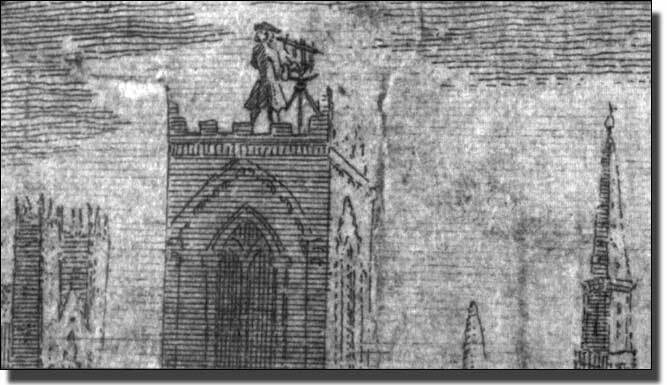 John Rocque, surveyor and map maker, at work on a tower. From Rocque's "Environs of London Maps"
The theodolite stands firmly on its tripod and because it is on three legs it cannot wobble. The sextant telescope swings round and the angle it turns can be noted down. He is measuring the angle of all the buildings, street crossings, etc. he can see round the tower and marking them on a drawing. When he has turned a full circle he will have a drawing looking like starburst, with a name of a church or street corner on each line and the tower he is standing on in the centre. When this is done he will climb down the tower and start measuring along each line with a measuring wheel. The surveyor sets the dial to zero and walks in a straight line to one of the buildings on his starburst. Each complete turn moved the dial one division and the final distance can then be marked on the line. He might have had an assistant to do that to save time, but he could have marked it himself on the plan he is carrying in his pocket. Then he would go back to his office and draw it all on his map. This would have given him one set of streets and buildings on his map. Next he would have gone to the top of another tower, which he had already mapped, and do it all again. Early sea maps of the Mediterranean are covered with these networks if radiating lines, measured I suspect in average sailing times from one port to another. Modern surveyors use the same methods but their theodolites measure both angles and distances. They record the angle and also send out a beam which bounces back from the building. The time it takes for the beam to hit the building and return is calculated and gives the distance an accuracy of 3 cms. It saves a lot of walking. Ships first used these echo sounders to calculate the depths of water below them. This saved many ships from running aground and so saved lives. It also revealed the sea ridges and plate edges which confirmed the whole theory of Plate Tectonics. This moved science a complete step forward, and the whole theory is now accepted. Modern surveyors use the same methods but their theodolites measure both angles and distances. They record the angle and also send out a beam which bounces back from the building. The time it takes for the beam to hit the building and return is calculated and gives the distance an accuracy of about 3 cms. It saves a lot of walking. I watched a surveyor and his assistant working their way silently along Stoke Newington Church Street. For the twentieth time that day they went through the same routine. The surveyor positioned his tripod and theodolite accurately over one of the many brass studs permanently set into the pavement. The position of this stud was known by satellite, so it was a fixed starting point. Without a word, the assistant placed the box of equipment he was carrying by the garden wall, safely within the surveyor’s sight and went off with his tall pole to the nearest traffic island, where he crossed the road. Church Street is a very twisty road and for some reason they were re-surveying the line of the opposite kerb, but why I did not know. The assistant placed his pole upright against the edge of the kerb and waited. The surveyor trained the theodolite on the pole. On the theodolite was a screen about the size of a driving mirror and he pressed a few buttons. He focused again on the pole, raised his left hand slightly, the assistant stood very still, and the surveyor clicked a button. The theodolite had read the exact distance from the brass stud to the pole on the opposite side of the road to within 3 cms, and also recorded the exact compass angle, in minutes and seconds. The surveyor raised his left hand slightly and the assistant walked forward ten paces, when exactly the same process was repeated. This was done about six or seven times, so the theodolite had recorded a map of perhaps sixty yards of kerb edge. It did not matter if the assistant was tall or short, if his pace was big or small, because the machine was reading angles and distances, not pace length. The assistant walked back across the road and picked up his box. The surveyor had folded his tripod and they walked off together silently round the corner, where it all started again. I have no idea if they liked each other or not. Perhaps they went to a café and had a cheerful meal talking about football. Perhaps they had a grumpy cup of tea. Nobody knows. The machine had done its work silently and so had they. About a year later, Stoke Newington Church Street was closed in one direction. Traffic could still travel east to west, but the northern side was blocked off from Albion Road to the High Street. For weeks two lines of barriers were erected f.or half a mile. One line ran down the centre of the road and the second was on the other side of the kerb stones, leaving a narrow pavement for pedestrians. The old Cornish Granite kerb stones were replaced with new ones imported from Portugal. A new kerb stone colour was being introduced to Church Street. This is a process which goes on all the time. Slowly and steadily London streets are rebuilt, slowly raised, layer by layer like geological strata, so that in some places one has to step downwards to the old shop floors. Ships first used the techniques used today by modern theodolites but they calculated the depth of water below them by measuring how long an echo took to travel to the sea floor and back to the ship. This saved many ships from running aground and so saved lives. It also revealed the sea ridges and plate edges which confirmed the whole theory of Plate Tectonics. It moved science a complete step forward, and the whole theory is now accepted. Modern surveyors measure the time taken by light, not sound, to travel from the theodolite to the assistant’s pole and be reflected back. It is an amazing example of modern electronic timing, measuring the speed of light in milliseconds.